To use password security, you must set a password. Hold down the Freeze button on the remote control for about five seconds or until you see this menu. Press the down arrow to select Password and press Enter. You see the prompt "Change the password?". Select Yes and press Enter. 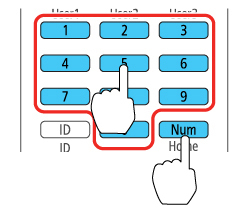 Press and hold down the Num button on the remote control and use the numeric buttons to set a four-digit password. The password displays as **** as you enter it. Then you see the confirmation prompt. Enter the password again. You see the message "Password accepted." Press Esc to return to the menu. Make a note of the password and keep it in a safe place in case you forget it. Published: Jun 28, 2016 Was this helpful​? Thank you for the feedback!